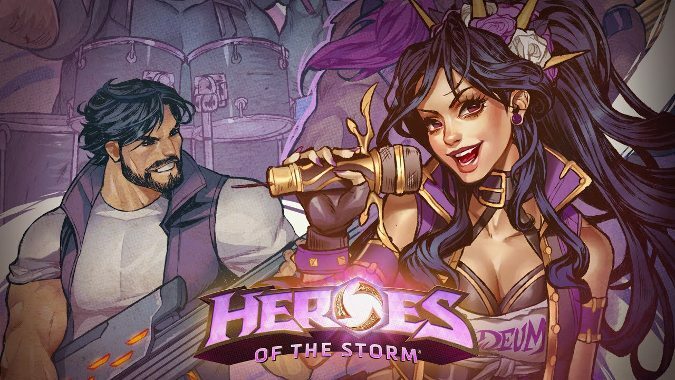 Heroes of the Storm has been having a bit of fun building an unofficial soundtrack for its vast array of characters. The first time around, they took a crack at choosing theme songs for their Warrior heroes. This week, they tackle Supports. It is through the archangel Auriel that the power of hope flows into the fabric of creation. Even when other celestial bodies up in the High Heavens were ready to give up on the mortals of Sanctuary and leave them to their gloomy fates, Auriel refused to give up—seeing in man the potential to finally create lasting peace. You may say she’s a dreamer. But she’s not the only one. Gabby La La is the closest one can come to being a Faerie Dragon IRL—except for maybe the very best cosplayers out there. The sitar and ukulele whiz and longtime associate of Primus’s lead weirdo Les Claypool brings the same mixture of sickly sweet idiosyncrasies and thinly-veiled threats of malice to her music that Brightwing brings to the Nexus. “I’ll be doing all I can / If I die an honest man.” Above all else, Kharazim remains true and devoted to his faith, embodying the will of the one thousand and one gods of Ivgorod in all of his actions. He’s also known to get down to a killer bassline. Li Li is the Taylor Swift of the Nexus. She carries herself with the same youthful optimism that’s so relentless it can, at times, seem endearingly naïve. She always tries to see the best in herself and others, and if some giant ogre is trying to get her down? She just shakes it off. And just like Taylor Swift, Li Li can summon a giant spirit dragon to take down her most powerful enemies—even Katy Perry. Editor’s Note: There was originally a lot of heated discussion around what would be a good alternative theme song for Li Li since Taylor Swift had deliberately kept her music off Spotify and other streaming services—a decision Swift reversed just as we were drafting this playlist. While we can’t speak for Taylor Swift’s intentions in lining up perfectly for our schedule, we’d like to thank her for her support of Li Li and all the denizens of the Nexus. Lt. Morales is the epitome of the dutiful pocket healer. No matter the danger posed by your foes, she’ll follow you into battle, keeping you alive through the most intense moments of any fight. Just like Rihanna says to Drake, she can tell “by the way you carry yourself” that “you’ve been hurt by someone else.” And if you’ll let her, she’ll take care of you. The walking boombox of the Nexus, Lúcio can always pump up the jam no matter what the situation. Plus he can put up a massive barrier for all those moments when the jam session gets too intense. Though Malfurion is always happy to throw down in the Nexus, he still heeds the call of the wild he’s sworn to protect—hungering for the “freedom of an eagle as she flies,” mountains “callin’ to him like a mother calls her child,” just like the star of this classic country tune by Chris LeDoux. Luckily some of the Battlegrounds have ample space for a jungle. Tyrande is Massive Attack’s best song personified: mysterious yet staid, vulnerable yet fearless, ornate and beautiful all at the same time. Plus she’s the only character here who can take credit for adding a teardrop as an item to World of Warcraft. And don’t think think her owl would totally make for a great mascot for Massive Attack. Uther the Lightbringer tried his best to save Prince Arthas from the forces that were fast corrupting him . . . but in the end, he didn’t succeed. Arthas, in turn, got something he wanted (Frostmourne), but not what he needed (a mentor who could help him become a nice person instead of turning into an undead Lich King). Do you think Uther still travels around the Nexus as an act of penance—trying to guide others home by his light, as Chris Martin promises he’ll do in one of Coldplay’s earliest hits? Personally, I come from the pro wrestling school of theme songs. Someone’s theme song needs to both encapsulate the character and get people absolutely stoked when their favorite shows up. Let’s take Rehgar, for example. Rehgar has actually trained gladiators. What is pro wrestling if not modern gladiatorial combat? In pro wrestling terms, Rehgar is a manager. Rehgar is also a Shaman of the Horde, wielder of the elements, and a primal and brutal hero, despite being a Support character. Rehgar is the dude who goes Ghost Wolf to lunge into the ring, playing interference so his guy can win the title belt. Is he gonna do that while Duran Duran is playing? Hell no, G.I. Joe. The word wolf in the song title isn’t enough to make it a theme song! You should be able to feel Rehgar’s theme music drumming deep in your chest. And what’s up with that Lucio choice? Lucio is an EDM artist who writes his own music. You’re going to use Pump Up The Jam? Seriously? What is this, 1990? If you want a song Lucio would play while skating into battle, perhaps you should consider the music Lucio wrote and plays while skating into battle. If wanting to use Spotify is a hurdle, no sweat — Spotify users have assembled a bunch of EDM playlists for Lucio, including playlists populated with music specifically from Brazilian artists. Props to the Heroes team for assigning Shake It Off to Li Li. That one totally works. I love me some Massive Attack, too. I don’t know if Teardrop is a Tyrande song, but I’ll accept it. Even if I don’t love their chosen soundtrack, I love that they’re making it. I take soundtracks very seriously and am loving the opportunity to be a nitpicking dingbat.